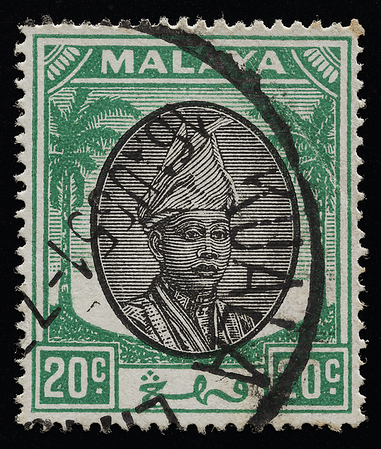 Sultan Sir Abu Bakar Ri-ayatu'd-Din Al-muadzam Shah ibni Al-marhum Al-mu'tasim Bi'llah Sultan Abdullah (1904–1974), wearing the Pahang sultan's distinctive tengkolok with no downward fold at the front. 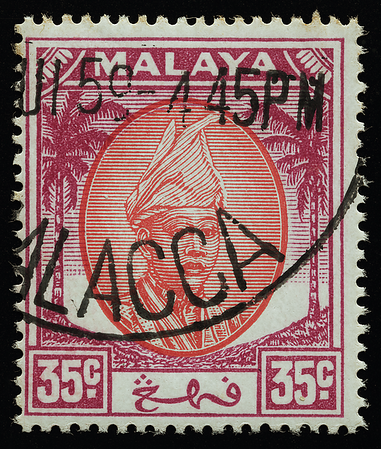 His portrait is the only right-facing one among those of the Malay sultans in the coconut definitives. The sultan often travelled the state and was friendly and approachable to commoners, a disposition apparent in the portrait. See Hale (1994) and Murray Payne (2015c) for discussion of shades, ultraviolet fluorescence and dates of the Pahang issues. 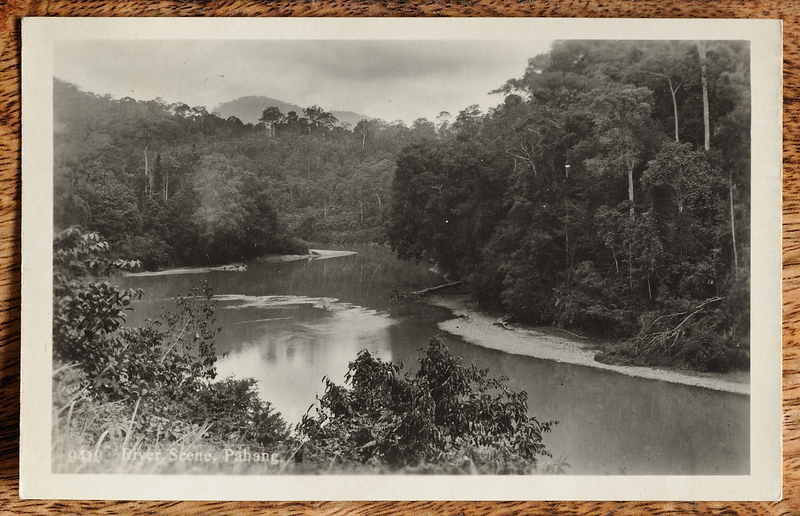 The interior of Pahang, a vastness and wildness that can only be articulated by the proclamations of the offstage horns in Mahler's Symphony No. 2, seemingly calling from distant mountains. Published by Houghton Butcher (Eastern) Ltd. for the British Empire Exhibition in 1924. 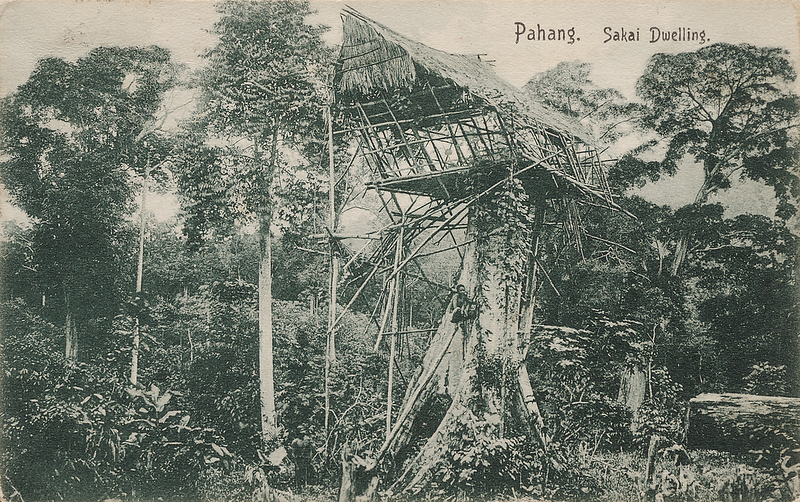 An orang asli tree house, with a native perched halfway up the trunk, c. 1910. Published by Wilson & Co. Photographers of Orchard Road, Singapore. Pahang is the main gateway to Gunung Tahan, the highest mountain in the Malay peninsula. 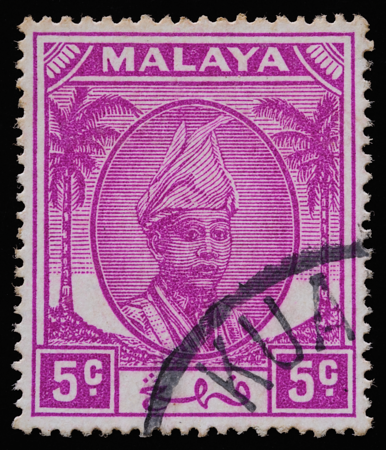 One of the author's regrets is that the magnificent tigers engraved on the pre-war issues of the Federated Malay States did not live on in the low-denomination medallions of the coconut definitive, for which the Pahang series would have been a good candidate, in the same spirit as the sheaf of rice of Kedah. 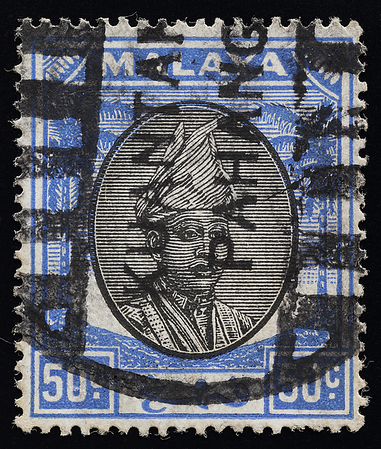 Kuantan, where this stamp received its parcel post chop (Hale 2017), was known for the catastrophic sinking of the British warships HMS Prince of Wales and HMS Repulse off its coast by Japanese navy bombers on 10 December 1941. The extra-heavy font of the duty tablets of the Pahang 35 cents (right) appears to be unique in the entire œuvre of coconut definitives, found in no other state or non-dollar denomination (Lin 2017c). The lower hook of the "c" also ends in a horizontal cut uncharacteristic of the typeface. It remains a mystery how this came about. 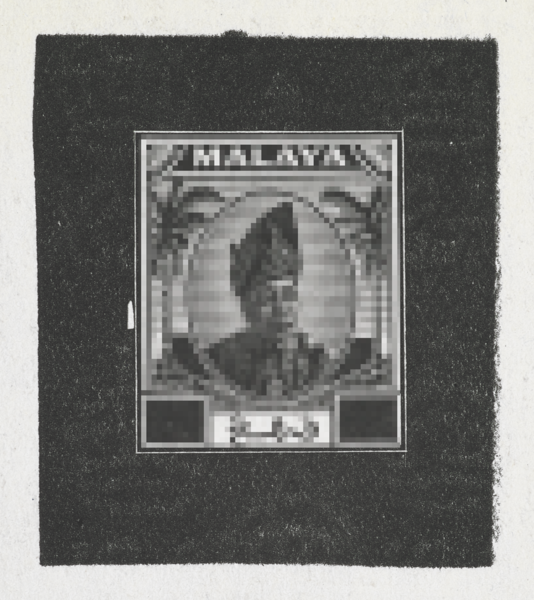 An uncleared progressive die proof on non-chalky paper exists showing an unapproved alternative portrait of the sultan, who looks too dark and too relaxed, and possibly too similar to the sultan of Selangor. 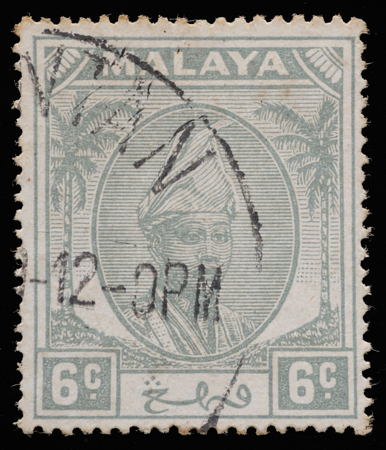 The author commissioned for his private collection a high-resolution photographic reproduction (pixellated because of copyright) of the original proof in the Crown Agents, Philatelic and Security Printing Archive held at the British Library. 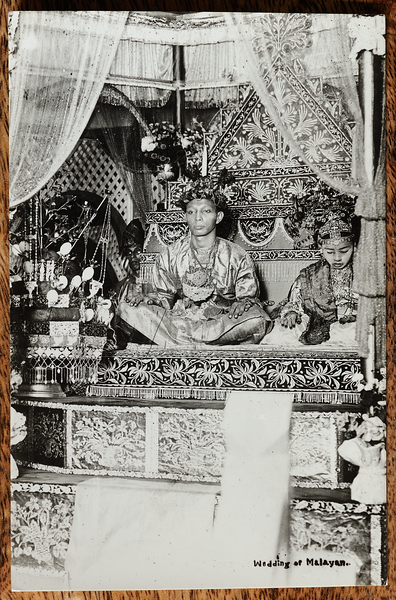 The bersanding (enthronement) ceremony at the wedding of the young Tengku Abu Bakar (1904–1974), future Sultan of Pahang, matchmade to 16-year-old Raja Fatimah, daughter of Sultan Iskandar of Perak, in Pekan or Kuala Kangsar in 1926 (Ibrahim 2011). The couple sit on a raised pelamin, decked out in their songket finery of handwoven gold thread. To the Tengku's right is a bunga pahar, a decoration of flowers and eggs that signifies fertility. Abu Bakar married eight times in his life (Corfield & Corfield 2012), sometimes to non-royals such as actresses. The scene reminds the author of the magnificently intricate chambers of the Potala Palace in Tibet. In August 1945, after the Japanese surrender, while the sultan was travelling from Kuala Lipis to Pekan, Force 136—the clandestine British organisation set up throughout Southeast Asia to aid resistance movements in enemy-occupied territories during the war—intercepted him and escorted him into hiding in the jungle for three weeks to protect him for fear that the communist Malayan Peoples' Anti-Japanese Army might have intentions to capture or kill him. The orders were issued from Ceylon (Cheah 2003). In an eco-tourism campaign in 2017, the village of Sungai Ruan was recognized as the home of the Musang King, a variety of durian claimed by the state authorities to be the best in the world.